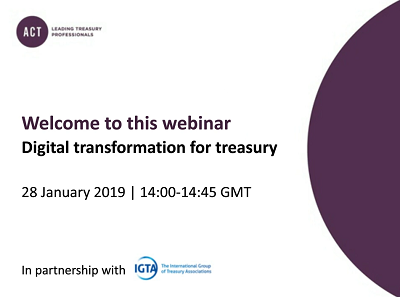 The International Group of Treasury Associations, in partnership with the ACT, a founding member of IGTA, held a webinar on the latest digital technologies, including blockchain, and how are these being applied to benefit corporate treasuries. Brad Fox, an IGTA delegate for many years and a former chairman of the National Association of Corporate Treasurers in the U.S., and Adjoint's Richard Magrann-Wells discussed cutting-edge treasury applications. 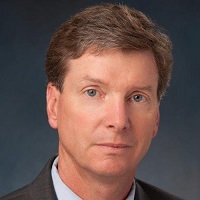 Brad Fox is an experienced treasury and finance executive with a background at public and private equity-owned companies and money center banks. 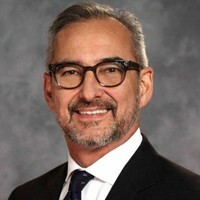 He is currently the Treasurer at NetApp, Inc., an enterprise storage and data mangement company where his responsibilities include global treasury operations and cash management, foreign currency risk management, and capital markets activities. Prior to NetApp, he was the corporate treasurer at Safeway Inc. for 18 years, and oversaw the merger of treasury operations with the Albertsons grocery chain after Safeway was taken private in 2015. His management responsibilities included corporate cash management, bank and capital markets relationships, and interest rate and currency risk management. Prior to his work at Safeway, Brad spent many years in client relationship management with middle market and corporate banking groups at several banks including Wells Fargo, Citigroup, Merrill Lynch and Bank of Montreal. Since 2001, Brad has been active as a board member of the National Association of Corporate Treasurers, a national non-profit dedicated to the sharing of best practices in treasury, and has served in all executive committee positions including Chair in 2010. He also maintains a personal affiliation with Positive Coaching Alliance, a non-profit focused on character development in youth athletes through sports, and has served on the board of the San Francisco Bay Area Chapter since 2011. Brad holds an undergraduate degree in Political Science from Stanford University and a MBA in Finance from the Haas School of Business, University of California, Berkeley. Richard Magrann-Wells is the Head of North American Sales for Adjoint (www.adjoint.io). Prior to assuming this role, he served as Executive Vice President of the Financial Institutions Group for one of the leading global risk advisors. Before entering risk advisory, Richard had a successful 25-year banking career. He has managed sales, trading and structuring teams for some of the biggest financial institutions. Richard completed his Master of Laws (LLM) degree in Banking and Financial Law at Boston University. He holds an MBA in Finance from New York University’s Stern School of Business, and an undergraduate degree in political science from the University of Southern California, Los Angeles. He received his law degree from UC Hastings College of the Law, San Francisco and has been a member of the California Bar since 1986. He mentors regularly at the Plug and Play Tech Center in Silicon Valley.